What is FOMO? And why is it so important? Well, it’s one of the most popular syndromes of the 21st century – the fear of missing out. More than half of social media users are experiencing FOMO. They are continuously afraid of missing something – an event, news, any office activity or the promise of cake in the break room. You’ve probably witnessed the zombie apocalypse that the company lunch room becomes. 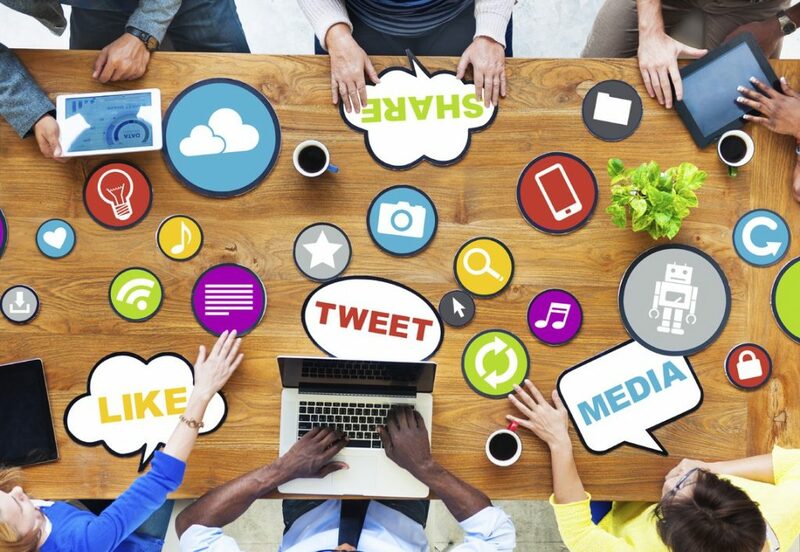 Employees don’t talk any more; they are too busy commenting, liking, sharing posts and tweeting. Have you ever thought how this affects work behavior? If not, you should now. The fear of missing out is not a joke. Not taking it seriously can result in a loss of productivity and cost you a lot of money. Want to know why and how you can get around it? Keep reading. When we hear about FOMO, the first thing that comes to mind is a group of teenagers walking around like zombies with smartphones in their hands. But the truth is those teens have grown up and are now your adult workforce. Our offices are flooded with millennials who share the same fear. It can be a fear of not be invited to the meeting, important discussion, corporate party or even a group lunch with that super hilarious guy from the marketing team. Such concerns can cause stress at work and demotivate employees. Well, let me explain what this curve means. There is a finite amount of information that one person can consume in a day. And if additional new info appears, it can result in a loss of an employee’s decision accuracy and productivity. In other words, if your little zombies eat too much, they will want to sleep it off, and their ability to work and think will be really low. Just imagine the day of an average worker. Let’s call him Andy. Andy suffers from FOMO, and he constantly checks his social media at lunch: he checks Facebook for new messages, Instagram for new photos of his friends, LinkedIn and Twitter for professional news. Andy also keeps getting messages from coworkers about meeting times and project issues during working hours. Together with those messages he gets weather updates, popular jokes and The Walking Dead spoiler alerts. Moreover, Andy gets a bunch of work emails too. So, the amount of information that Andy digests every day is unbearable. On one hand, good communication beats Andy’s fear of missing anything that could be important (or not so important). But on the other hand, the barrage of overwhelming information does not allow him to concentrate at work properly. Not all of the information we are getting is necessary or interesting for us. A recent study entitled ”Information Overload” was based on a survey of 1,520 Americans. 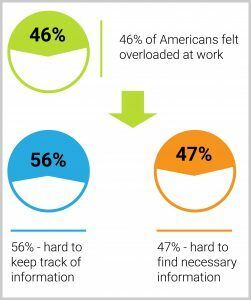 It showed that nearly half (46 percent) of Americans felt overloaded at work. 56 percent of them said they found it hard to keep track of information, while 47 percent stated they had trouble with finding information. There is a bucketload of notifications from work that occur on the PC screen, tings on a smartphone and buzzes on your tablet. These things disturb us not only at work, but also at the gym, restaurant, during our child’s football game or on vacation. We want to know what is happening in the world as much as we want to stay productive and not be annoyed by unnecessary data. So what can we do to avoid this situation and help all the Andies in our workplace to stay productive? If FOMO results in a loss of productivity, there should be some JOMO in the world that can convert Fear into Joy. Don’t you think so? I do and I’ve found out where you can find it. Team messengers! Yes, these team collaboration tools can solve FOMO and the information-overload problem. I can not promise that all of them can do that completely, but some of them have such features. The main advantage of such software solutions is in their ability to sum up all the information from different sources. If you already have a team messenger or are planning to use one, you’d better check if it has the necessary functionality to convert the fear of missing out into the joy of missing out. Say NO to innumerable notifications. Employees should have an opportunity to limit the amount of information they are getting everyday. We all have our own tolerance level. It’s impossible to set a limit, that will suit everybody. The amount of consumed information by a CEO, software developer, graphic designer or marketing manager will differ a lot together with their ability to handle it. Choose your own way of communication. Well, there are different types of information that an employee is getting during the work hours. And each type of it should be converted with the right tool. In simple words, for an average guy like Andy it will be easier to use specific features of a business messenger for specific goals. For example, he’ll use video calls to hold meetings with international partners, text messages to discuss day-to-day activities and transcripts of voice messages to answer the customers. There should be all needed types of communication for each business-process in your messenger. Use AI-powered features. Easier is better. 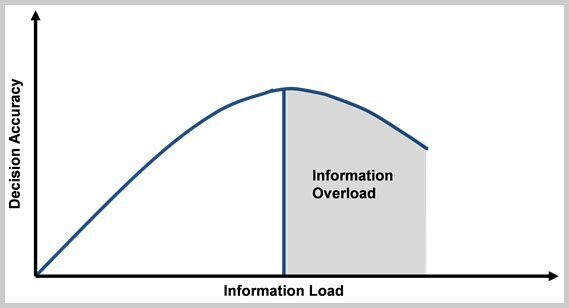 There is a reason for information overload; it’s too hard to use all of those software tools to absorb that enormous quantity of information. And if your messenger has AI-powered features, it’s a great chance to improve your productivity immediately. Let me explain what those features can be. A perfect example is “message suggestions.” Usually we have some unique personal patterns for answering specific questions. And if your messenger has artificial intelligence, it will learn how to answer these questions and will begin to offer up typical answers immediately. There is no need to type anymore, just select. Isn’t it ideal for your employee to spend less time on communication (with the help of a self-learning machine) and still gets all the information he or she needs? AI technology is your opportunity to kill that FOMO and improve employee productivity. Do not miss it! So in summary, remember that FOMO, becoming more and more widespread every day, can be dangerous to your business. It results in information overload and is killing employee productivity. There are solutions that you can use to prevent FOMO at your workplace, including implementing the right team messenger. Some features of team messengers can deal with that. Don’t delay the decision to use a team messenger at work. Remember that productivity is the main component of success.